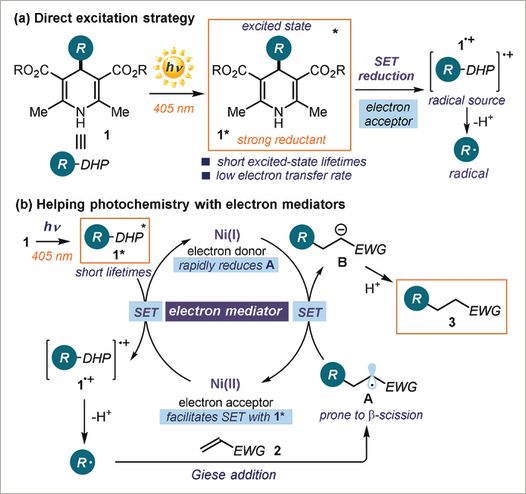 We report a simple protocol for the photochemical Giese addition of C(sp3)‐centered radicals to a variety of electron‐poor olefins. The chemistry does not require external photoredox catalysts. Instead, it harnesses the excited‐state reactivity of 4‐alkyl‐1,4‐dihydropyridines (4‐alkyl‐DHPs) to generate alkyl radicals. Crucial for reactivity is the use of a catalytic amount of Ni(bpy)32+ (bpy=2,2′‐bipyridyl), which acts as an electron mediator to facilitate the redox processes involving fleeting and highly reactive intermediates.